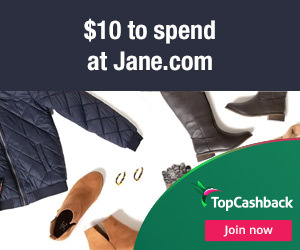 Jane.com offers daily deals on clothes, accessories, and shoes for the family. They also have beauty products, toys, stuff for pets, home decor, and much more. 2. Once logged in, click the "Get Offer" button and you'll be directed to the Jane website to make your purchase. Note: If you're on mobile, scroll down and click on "View Desktop Site" to see the cashback button. 3. Add any item or items that totals to $10 (excluding sales tax and shipping) to your cart and checkout as normal. 4. In about 14 days $10 will post in your TopCashback account. Offer valid through May 1, 2019.